So who Pwned the DNC’s and HRC’s email servers? The Russians? 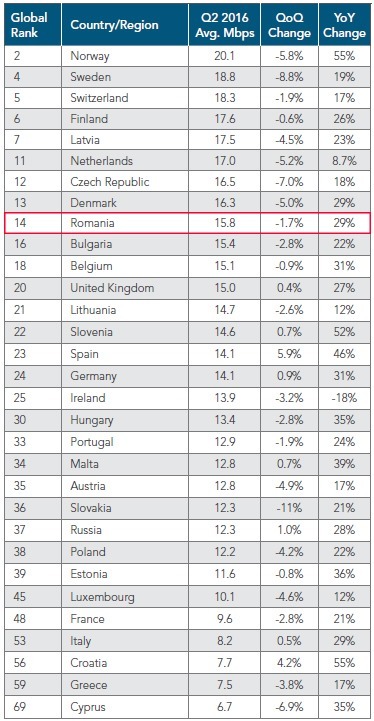 Romanians? Or was it just your run of the mill Developer/SysAdmin/Staffer with an axe to grind? To find out more, check out the post by William Binney and Larry Johnson. If you are still confused about the how and the who, you are not alone. The reason for this heavy fog is that it’s impossible to separate the spin from facts without access to the forensic data–which for some reason doesn’t’ seem to make itself available. As far as the pro and con arguments for a local vs. remote access are concerned, yes, theoretically an external attacker could have used a cocktail of zero day + remote privilege elevation + password recovery against the cloud based NGP VAN voter system, but so could a local user/administrator at a fraction of the time and effort. What about the identity of the perp? According to the WaPo (using CrowdStrike, DOJ, and their other usual hush-hush government sources), the attack was perpetrated by a Russian unit lead by Lieutenant Captain Nikolay Kozachek who allegedly crafted a malware called X-Agent and used it to get into the network and install keystroke loggers on several PCs. This allowed them to see what the employees were typing and take screenshots of the employees’ computer. But if that was the case, then how did the DOJ learn all of this ‘very specific’ information used in the indictments without the FBI ever forensically evaluating the DNC/HRC computers? And since when does the DOJ, an organization that only speaks the language of indictments use a 3rd party like CrowdStrike as a primary source in an investigation? Another noteworthy observation is that three of the Russian GRU officers on the DOJ wanted list were apparently working concurrently on multiple non-related projects like interfering with the 2016 United States elections (both HRC and DNC) while at the same time they were also allegedly hacking anti-doping agencies (Images 2-3). The fact that the three had multiple concurrent high impact and high visibility project assignments is odd because this is not how typical offensive cyber intelligence teams operate. These units tend to be compartmentalized, they are assigned to a specific mission, and team members stay with the same taskforce for the entire duration of the project. And this riddle wrapped up in an enigma doesn’t stop there, in addition to shoddy cyber forensics, we also have all of the questionable MSM investigative work that links the attacker to the pseudonym Guccifer 2.0 and identifies him as a Russian. He used a Russian VPN service to cloak his IP address, but did not use TOR. Using a proxy to conduct cyber operations is a SOP in all intelligence and LEA agencies. He used the AOL email service that captured and forwarded his IP address and the same AOL email to contact various media outlets on the same day of the attack. This is so overt and amateurish that its unlikely to be a mistake and seems like a deliberate attempt to leave traceable breadcrumbs. He named his Office User account Феликс Эдмундович (Felix Dzerzhinsky), after the founder of the Soviet Secret Police. Devices and accounts used in offensive cyberspace operations use random names to prevent tracing and identification. Why would anyone in the GRU use this pseudonym (beside the obvious reason) is beyond comprehension. 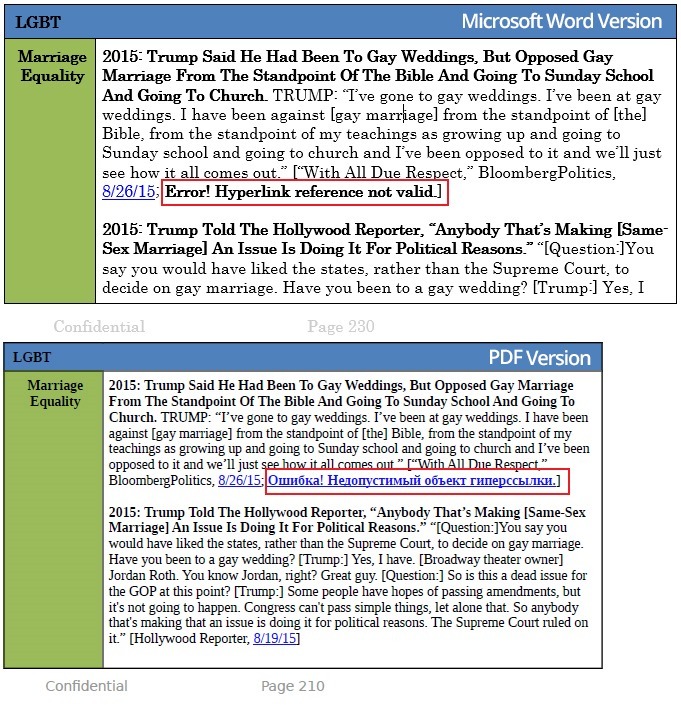 He copied the original Trump opposition research document and pasted it into a new .dotm template (with an editing time of about 2 minutes). 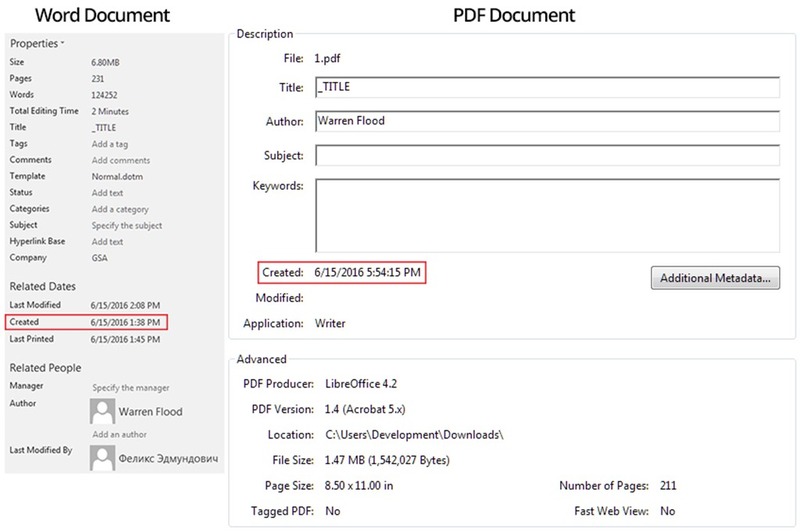 This resulted in a change of the “Last Modified by” field from “Warren Flood” to “Феликс Эдмундович” and the creation of additional Russian metadata in the document. Why waste the time and effort doing this? About 4 hours after creating the ‘Russian’ version of the document, he exported it to a PDF using LibreOffice 4.2 (in the process he lost/removed about 20 of the original pages). This was most likely done to show additional ‘Russian fingerprints’ in the form of broken hyperlink error messages in Russian (Images 4 and 5). Why bother with re-formatting and converting the source documents? Why not just get the raw data out in the original format ASAP? In June 21, 2016, Lorenzo Franceschi-Bicchierai from Vice Motherboard interviewed a person who identified himself as “Guccifer 2.0”. During their on-line chat session, the individual claimed that he was Romanian (see transcript of the interview below). His poor Romanian language skills were later used to unmask his Russian identify. Just like with any other form of propaganda, disinformation and misinformation, this one too is laced with partial truths and inaccuracies. If you read the actual text of the on-line chat, Guccifer 2.0 never “denied knowing any Russian”, he said “Just a moment I’ll look in google translate what u meant ”. Not that this makes much of a difference. Both, the study and the NYT article’s pompous and pretentious assertions read as if they were written by the team behind the Kid Snippets episode of the “Salesman“. I’m not a scientific linguist nor do I even know where to find one if my life depended on it, but I’m certain that you can’t reliably determine nationality based on someone impersonating another language or from the use of fake metadata in files. This elaborate theory also has the obvious flaw of assuming that the Russian intelligence services are dumb enough to show up to an interview posing as Romanians without actually being able to read and write flaunt Romanian. I used 0-day exploit of NGP VAN soft then I installed shell-code into the DNC server. it allowed me to intrude into DNC network. They have Windows-based domain architecture. then I installed my Trojans on several PCs. I had to go from one PC to another every week so CrowdStrike couldn’t catch me for a long time. I know that they have cool intrusion detection system. But my heuristic algorithms are better. For Guccifer 2.0 to develop/purchase a zero day for the cloud based NGP VAN system, he had to either have access to the source code or the runtime. NGP VAN is not publicly available, so where did he get the initial copy (before breaching it)? And if there was a zero day exploit, what is it? He also only discusses high level concepts like installing shell code and Trojans, what is ostensibly missing are the exploit details and the pride of authorship. The general impression is that Guccifer 2.0 is not a coder, he sounds more like a script kiddie. The purpose of this whole interview is also puzzling, instead of factually discussing the lifecycle of the exploit, he spends the time boasting about fluffy things like being a ladies man and his interest in expensive Italian fashion. strongly suggests that we are either dealing with a wannabe or that the conversation was staged. It is unlikely that an intelligence organization would for no other reason than bragging rights disclose a vulnerability in CrowedStrike’s Falcon prodcut–and boast about their ability to evade it. Finally, his assertions that he installed the shell-code on the DNC server, gained access to the internal network, placed Trojans on several PCs and subsequently re-visited these PCs for several weeks, could have also been easily verified. Each server/PC/laptop/endpoint that he accessed had logs that captured some of these alleged actions. Even if they didn’t capture all of his nefarious traffic, they would still show some activity like PowerShell usage, logins, and application/process and registry changes. So why aren’t we seeing CrowdStrike’s SIEM dump of the DNC and HRC projects? The bottom line is that if we want to go beyond the speculative trivia, the pseudo science, and the bombastic unverified claims, we have to ask the real tough questions, mainly: is Guccifer 2.0 even the real attacker and how did he circumvent all of the logs during several weeks of repeated visits while downloading close to 2 GB of data? “Path of Least Resistance”+ “Principle of Least Effort” + “Opportunity” + “Motive” = One of them green guys on the right side of Image 1. [Motherboard:] So, first of all, what can you tell me about yourself? Who are you? [Guccifer 2.0:] i’m a hacker, manager, philosopher, women lover. I also like Gucci! I bring the light to people. I’m a freedom fighter! So u can choose what u like! [Motherboard:] And where are you from? [Motherboard:] Do you work with Russia or the Russian government? [Guccifer 2.0:] No because I don’t like Russians and their foreign policy. I hate being attributed to Russia. [Guccifer 2.0:] I’ve already told! Also I made a big deal, why you glorify them? [Motherboard:] Tell me about the DNC hack. How did you get in? [Guccifer 2.0:] I hacked that server through the NGP VAN soft, if u understand what I’m talking about. [Motherboard:] So that was your entry point, what happened next? [Guccifer 2.0:] I used 0-day exploit of NGP VAN soft then I installed shell-code into the DNC server. it allowed me to intrude into DNC network. They have Windows-based domain architecture. then I installed my Trojans on several PCs. I had to go from one PC to another every week so CrowdStrike couldn’t catch me for a long time. I know that they have cool intrusion detection system. But my heuristic algorithms are better. [Motherboard:] When did you first hack them? [Motherboard:] And when did you get kicked out? [Guccifer 2.0:] June 12, when they rebooted their system. [Motherboard:] And why did you hack the DNC in the first place? [Guccifer 2.0:] DNC isn’t my first deal. [Motherboard:] Who else have you hacked? [Guccifer 2.0:] Follow my blog and u’ll know! I can’t tell u now about all my deals. My safety depends on it. [Motherboard:] OK, I understand. But why did u target DNC? why are you interested in them? [Motherboard:] Ah yeah of course. Did you know him personally? [Guccifer 2.0:] I can’t answer cause I care for Marcel. [Motherboard:] Or u just use Google translate? [Motherboard:] Do you like Trump? [Guccifer 2.0:] What’s this? Is it russian? [Motherboard:] You don’t understand it? [Guccifer 2.0:] Man, I’m not a pupil at school. [Motherboard:] What do you mean? [Guccifer 2.0:] If u have serious questions u can ask. Don’t waste my time.